It doesn't matter how many photos of the leaning tower you might have seen, nothing can compare with seeing it first hand. It stands in the Square of Miracles beside the Duomo. 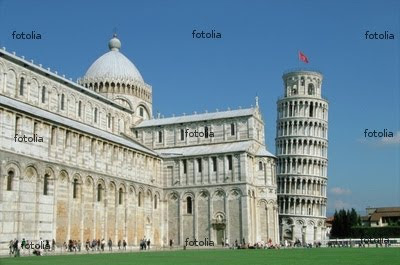 Pisa with its leaning tower is our first port of call this morning. One hour and thirty minutes from Florence towards the Mediterranean sea and we arrive at the parking. Instead of taking the public bus to the drop off I rang ahead and booked a little train which is a lot more fun even if it is only a 5 minutes ride. It doesn't matter how many photos of the leaning tower you might have seen, nothing can compare with seeing it first hand. It stands in the Square of Miracles beside the Duomo. Started in the 12th century it took many hundreds of years to build due to inexplicable pauses in construction. The original architect has the unforgettable name of Bannano Pisano. We caught the train back to meet the coach and started on our way around the Mediterranean coast. The famous marble quarry of Carrara are always mistaken by many for snow on top of the mountains as we near the end of the coastal plains north of Pisa. Still considered to be one of the most beautiful of the natural building materials it is shipped around the world. From here it is a spectacular drive through the Ligurian Alps as we make our way around the Gulf of Geneva on our way the city of the same name, one of Italy's largest ports. Lunch is taken on the Autostrada today. An hour after lunch and we reach the border and the end of tunnel counting. I could tell you the number but it would spoil it for people reading this who have not done a tour yet. Thirty minutes later and we are in the Principality of Monaco. Home and visiting place of the rich and famous, Monaco has been a favored destination for many years, it is spectacular in so many ways. The harbor with the mega yachts and driving on the circuit for the Monaco Grand Prix are the prelude to our visit. The walk through the gardens hightens peoples anticipation of our arrival to the casino built in the mid 1800's by Charles Garnier. Although famous for the casino it brings in only a small percentage of the principalities annual income, most of that comes from financial services. A visit to the old casino foyer is a must as it is breathtaking. For more information about traveling; please have a look at http://www.affordable-cruises-tours.com . I like traveling and would like to share my experience with others.